As Worshipful Master of the University of Birmingham Lodge No 5628, may I welcome you to our webpage. 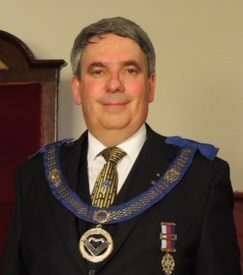 I feel honoured to have been installed into the chair of 5628, and it is a distinct pleasure to be Worshipful Master of my university lodge. The lodge is a member of the Universities Scheme which allows members to join at the age of eighteen rather than the twenty one as with non Scheme Lodges, and has a number of enthusiastic younger Masons helping to keep the more experienced brethren enthused and “on their toes”. Membership is not however restricted to the students or graduates of the University of Birmingham, and we welcome applicants of good character who are aged eighteen or over and who have a belief in a Supreme Being. We are always pleased to see visitors from other Lodges (or indeed other Constitutions) and you will always receive a warm welcome from the members. Our meetings are on the third Saturday mornings of September, November, February and April at Severn Street Masonic Rooms in the centre of Birmingham the timings of which were historically linked to the academic year. Extra meetings in addition to our scheduled meetings are not however unusual if our workload demands it. If you are interested in applying to join or are a member of another Lodge who wishes to visit please contact the Lodge Secretary whose email address can be found on this webpage.